Gusta Minori is a gastronomic experience of the most celebrated culinary regions in Italy the Amalfi Coast. Instructors for this program will be Pro. Ezio Falcone, a food historian and writer, and Chef Giuliano Donatantonio, executive chef at Hotel Villa Romana. Both are members of the Federazione Italiana Cuochi (Italian Chefs Association) and of the Accademia della Cucina Mediterranea. Ezio Falcone has spent more than 30 years researching recipes from Roman times and now re-proposes these recipes with ingredients available today. Chef Donatantonio is a graduate of IPSAR a nationally well respected cooking school in Salerno. His resume includes many of the best hotel restaurants in Italy and Europe. He has excelled brilliantly in numerous international culinary competitions and is a specialist in pastry making. Single day cooking classes are available for a minimum of 2 participants. Arrival in Naples, pick up at the airport or hotel at time set by Gabriele’s Travels to Italy, transfer to the hotel Hotel Villa Romana in Minori (Amalfi Coast). Hotel check in, and time to relax before a welcome reception and dinner. Breakfast. Excursion to Pompeii, one of the most popular archeological sites in the world. Guided tour of the excavations with a professional English-speaking guide. 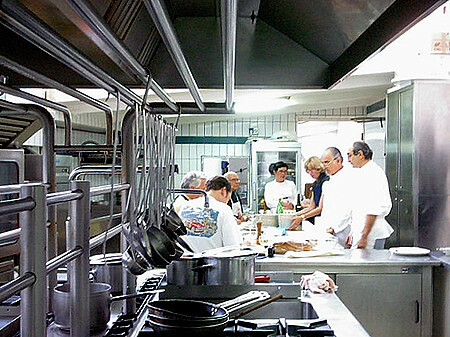 In the afteernoon return to the hotel for your first cooking class. Dinner will follow the class, and overnight. After breakfast guided visit of a Limoncello factory with a demonstration of production techniques. Limoncello is a sweet liquor with an intense unique flavor. This drink is a classic of the Amalfi coast prepared from locally grown lemons. A visit to a Roman villa will follow the Limoncelo field trip. In the afternoon attend a second cooking class. Dinner at local restaurant and overnight. Morning field trip to visit a cheese factory where delicious Mozzarella is produced along with other cheeses. Free time for independent activities before the afternoon third cooking class. Dinner at the end of the class and overnight. End of the tour and departure for your next destination. €1105, per person, based on double occupancy, minimum 2 participants. Single room €1290; Low season. €1295, per person, based on double occupancy, minimum 2 participants. Single room €1450; High season. Private cooking class, for 2 people, without lodging or transportation, available from Monday to Friday check it here Single day cooking class. Gabriele's Travels to Italy continually strive to improve tour itinerary and features. If improvement can be made, or unforeseen circumstances beyond our control make changes necessary, we reserve the right to vary itinerary excursions and to substitute hotels and restaurants. Final documents and paperwork, sent out about three weeks prior to departure date, will include an updated itinerary.